It is more difficult to determine if a pineapple is ripe or not than it is with other fruits. Pineapple is different from other fruits because it gets its sweetness from the starches found at the plant’s base and stops ripening immediately after harvesting. Harvesting a pineapple cuts off its access to the starches and halts the ripening process. Many find it hard to determine whether a pineapple is ripe or not. Here we'll tell you the secret. Smell the stem end and determine if it has a sweet scent, which is the most important way of determining if a pineapple is ripe. A pineapple without a scent is most likely unripe. You can smell other sides and places as well but the strongest scent should come from the stem end. Do not pick a pineapple with a fermented smell. The scent of a fresh pineapple should not have a vinegar or alcoholic taste. Squeeze the pineapple lightly with your fingers. The fruit should feel firm but soft enough to give slightly as your press it down. A heavier pineapple has extra juice, which makes it sweeter and riper. Do not confuse heavier with larger. A ripe pineapple is very likely to be heavier than other pineapples of the same size. If a large pineapple has the same weight as a smaller one, pick the smaller one. The effectiveness of this method of how to tell if a pineapple is ripe is debatable. However, it is said that plucking a leaf on top of a ripe pineapple should be easy and without much resistance. However, the pineapple may be rotten if its leaves come off too easily. A ripe pineapple has a golden-yellow color but a green color does not necessarily mean the fruit is unripe. 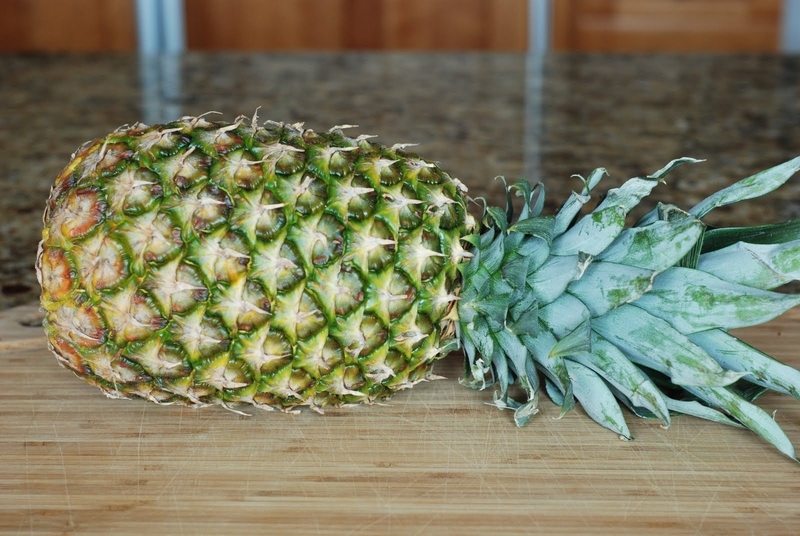 Some ripe pineapples are partially green but the fruit should not have an all brown or green color. The yellow color at the base should be easily visible and the higher it rises up the fruit, the sweeter the fruit. Alternatively, look at the color of the leaves. A ripe pineapple has healthy green leaves. Pick fully developed pineapples with developed, rounded eyes. The eyes refer to the spiked centers on the circular patterns on the surface. Eyes should be relatively flat and filled out. Pick pineapples from the closest growing location because they are still fresh after covering a short distance from the farm to your local store or supermarket. After learning how to tell if a pineapple is ripe and how to pick the right one, get a hefty knife and a chopping board to cut and enjoy this delicious fruit. Bear in mind that a tiny knife may not chop properly because pineapples are heavy. Cut off a good inch of the top and bottom, and then place the pineapple in an upright position. Slice off the skin of the pineapple. Chop off just enough skin to get the largest part of the shell off. You do not need to chop off extra flesh to remove the remaining bits of dark skin. Remove the leftover eyes. You can use a potato peeler to scoop out the dark pits with its end. Scooping with the end of the peeler preserves much of its flesh. Or you can use a knife. When using a knife, check the patterns of the pits and make a trench along their diagonal line. Make a line that spirals up the pineapple. Cut the pineapple in to slices or chunks. Cut the pineapples into four parts of equal length if you want to cut it into chunks. Cut out the core. The core is sometimes soft enough to eat but in most cases it is too hard to chew. If you cut the pineapple in slices, cut out the core located in the middle of every slide. If you decide to cut it into chucks, first cut it into four equal parts, remove the core section from each part, and then chop each into chunks. A whole and uncut pineapple can last for up to two weeks in the refrigerator. If you cut or remove its skin, it will last for up to a week. You can freeze a freshly cut pineapple for up to six months. Put the chunks in freezer-safe plastic bags or containers before freezing because freezing causes a pineapple to lose its flavor. Server responsed at: 04/23/2019 4:06 a.m.